Applicants have ranged from families dealing with trauma to single parents needing assistance with something as small as a new pair of glasses. For one family, a new pair of boots for work made all the difference when the hardworking father faced being dismissed from his employment because he couldn’t afford a new pair of steel toed boots for work. The Community Chest, donations from you, his neighbours, was able to purchase the boots and keep that father employed. 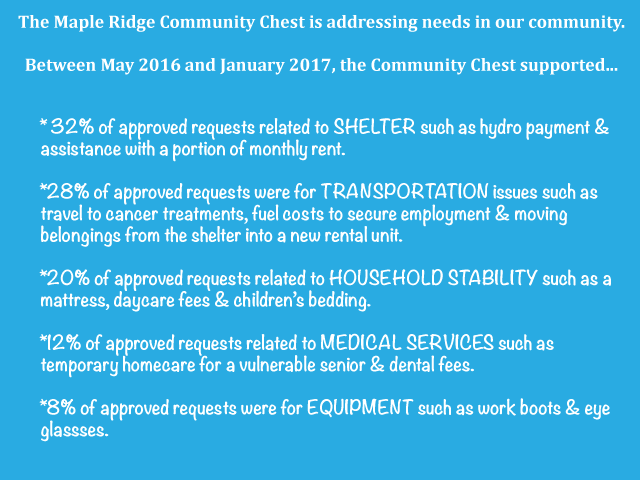 Since November 2016, the Maple Ridge Community Foundation has contributed to 11 families who were faced with challenges that had the potential to be insurmountable. These aren’t always large calls for help, but calls that may be unanswered were in not for this fund. The Community Chest is a neighbours helping neighbours campaign. Your donations go directly back into the community to assist your neighbours in need. Click here to hear their stories. Help fund the community chest with a one-time donation, regular giving or proceeds from a community fundraising event. Each contribution has the power to transform the life of both the donor and the recipient. You can give online right now by clicking on the icon in the right hand side-bar or you can contact us directly to discuss your donation options. I want to thank you for your help during this devastating time in our lives. Your funding has helped to ease some of the financial burden that was acquired in order to keep my family safe. Relief of some financial strain will help us be able to move forward from this challenging set of circumstances. This motion has helped remind me that there are still good in this world and the money is symbolic that there is love, care and support right here in our own community. My boys and I thank you from the bottom of our hearts.